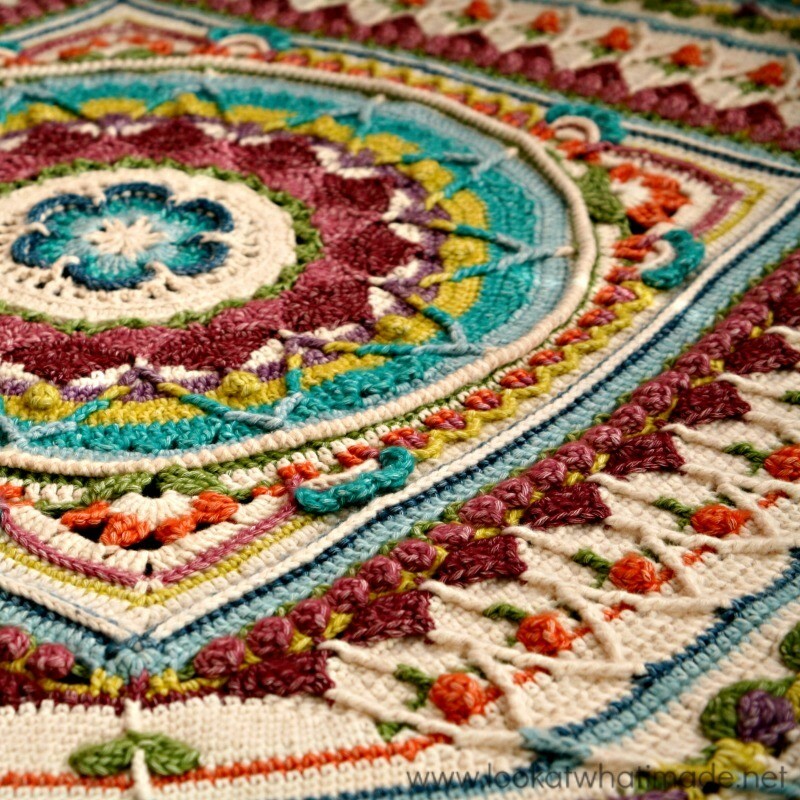 At the end of Part 10 of the Sophie’s Universe CAL 2015 , which we will be doing this weekend, we will be halfway through the CAL. For the small and medium blankets the estimated yardage is sufficient to allow for variance in gauge/tension, but for the large version I have specified just enough yarn to cover people who work as tightly as I do. I have had a few questions from people using the Stonewashed XL colourway, stating that they have run out of one colour or another (particularly Amazonite and Lemon Quartz). This indicates a significant difference in personal tension. I realize that people’s tensions differ, and as stated at the very start of the CAL, the yardages were estimates as I hadn’t completed all 3 versions (and still haven’t). So to help you figure out if you need to buy more yarn, I have put together a list of the grams and meters used per round (up to the end of Part 10). If you realize that you have used more yarn than me, you will need to either buy more yarn, or stop the CAL a few rounds sooner. Please keep in mind that you still need to make Part 10 (which is included in the Used to the End of Part 10 (meters) below). I will be making similar tables for the other sizes at a later date. See Part 10 above to see how much yarn (and which colours) you will be using in Part 10 on Sunday. The table below has already taken these values into account. The only colours you should be keeping an eye on at this point are the Amazonite and the Lemon Quartz (see the note below the next table). *Part 10 is the last time that Amazonite will be used. If you have 20 grams (or more) of Amazonite left at the end of Part 9, you’ll be fine for Part 10 and you won’t need to buy any more yarn. Lemon Quartz will be used for the last time in Part 12 and you should have at least 26 g left at the end of Part 9. The best way to check your usage is to weigh what you have left of each colour. It should be quite similar to what I have left (minus the yarn still to be used in Part 10). Yes, you have to do a bit of maths, but I wanted to get this information out to you as soon as I could, so you could make a timely and informed decision. If you have run out of Amazonite, but don’t want to buy any more yarn, use Moonstone for the Amazonite round (Round 77) instead. I hope you find these tables useful. I have not yet started the Crochet Along, but I’m looking forward to it. I will not be using wool, however (allergies) and am wondering what colors to buy. Moonstone looks like a cream, Amazonite a light blue, etc., but I was wondering if there is sort of a generic list of the yarn colors for those using other yarns, or if someone has purchased yarn colors similar to those listed. I will probably do the large size. There is not a generic alternative yarn list I am afraid. It is very much open to personal interpretation. Dedri, I hope you can update this chart as I just found it. I had previously ran out of the Amazonite color and subbed Moonstone per your suggestion. Now on round 88 of part 12 I’m short on the Lemon Quartz. I decided to order another skein. But, sure hope I don”t run into another shortage as I am in the US and don’t want to have to order more single skeins from Dermamores in UK. So, if you updated the chart after round 12, I could weigh my yarn left to determine if I’m going to need more of any more colors. I love your pattern, but in hindsight wish I’d have used yarn that I could source locally. Thank you! Candy, I am working on a table, but it is not just a cut-and-paste job, I’m afraid. If you were short of Amazonite and Lemon Quartz, your tension is looser than mine and you will most likely run out of all the colours. If you can weigh your Sophie at the end of Part 12, I will better be able to assist you. What about making a colorful bird? I agree–Dedri, you have gone above and beyond. I propose everyone that is participating in this CAL send ONE DOLLAR or equivalent to Dedri. From the number of projects posted on Ravelry, that would at least partially compensate her for the astounding amount of time and effort she has put into this!! Dedri the colors in the Bloom range are so bright and lovely… but files in a heavy weight that is not machine dryable doesn’t it take forever to dry? Seems so impractical for things I make that get a lot of use… So looking forward to what you might create it with it!!! Enjoy the weekend…. Looking forward to Sunday’s newest release! The amount of work you’ve put into this CAL just blows my mind. Thank you!! You are really such a giving person….you just give give give and give!!! I hope you know that you are making a lot of people VERY VERY happy with your talents and your sharing of information so freely and without expecting anything back. I truly feel blessed to have come across your website! Dedri, you are absolutely the best! You have worked SOOO hard on this CAL and it shows in every stitch, every tut and every blog post. I am doing a large blanket, but I have gotten all of my yarn locally, so I haven’t really kept track very well, because it isn’t a big deal to go pick up more (“Oh darn, I have to go yarn shopping again” ;-) ) I knew early on that my tension and gauge were looser and larger than yours and so I mentally accommodated for that. Hope you aren’t catching too much grief from people if they are using more yarn than your ESTIMATES. Love all that you do – keep up the fabulous work! !